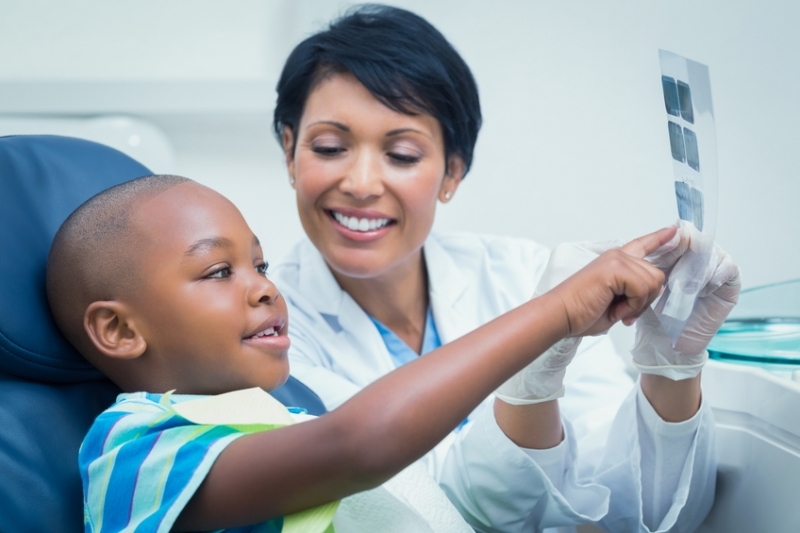 Dental X-Rays are a very important part of your children’s preventive dental treatment. They’re an extremely valuable diagnostic tool that allows dentists to see things in the mouth not visible to the naked eye. Being able to see what’s going on inside and between teeth means that dentists can find and prevent potential problems before they arise. When and how often should my my child have her first dental x-ray? There isn’t really a standard time for the first dental x-ray. It really depends on your child’s development and the state of her dental health. For children who are at a higher risk for cavities, for example, the dentist may recommend more frequent x-rays. For other children, x-rays can be done just once a year. These allow the dentist to see all of the teeth on one film. They also display both the upper and lower jaws, the sinuses above the teeth, and the tempromandibular joints. Panoramic x-rays are often used for children with facial injuries, orthodontic problems, or those who are physically or mentally disabled. It’s also useful for children who have strong gag reflexes or small mouths, as they do not require a film to be placed inside the mouth. These are used to view the places between the teeth, and show where cavities are starting. These x-rays only become necessary once children have two teeth that are touching. This often happens in children only after their first permanent molars have erupted. These are used to view the entire crowns and roots of one or up to 3 teeth that are all next to one another. It also shows the supporting bone structure surrounding the teeth, and allow the dentist to see a child’s permanent teeth growing in under the baby teeth. Occlusal X-Rays allow us to view most of the upper and lower teeth on one film, and are often used as an alternative to panoramic x-rays. These x-rays show the head from a side view, and are used to evaluate the growth of the jaws as it relates to the bones of the skull. Orthodontic x-rays help orthodontists diagnose malocclusion problems and create treatment plans. Yes! Dental x-rays are extremely safe. They expose your child to only a very minimal amount of radiation. When all the standard safety precautions are taken, x-ray equipment is even able to prevent unnecessary radiation, and allows the dentist to focus the x-ray’s beam on a very specific point in the mouth. High speed films have also helped reduce the amount of radiation exposure patients receive. During the x-ray, a lead apron is worn by the patient to further reduce radiation exposure. If you have more questions about x-rays for children, don’t hesitate to get in touch with the Smile Town Burnaby team for all the information you need!